Playing around with new software we purchased called Skanect which uses our trusty Kinect to scan in objects. The nice thing about this software is not only the interface but also the fact that it has some editing options like closing holes and cropping built in as well as colorizing the final object. I’m also really enjoying pushing models to Sketchfab which has really nice embed options. You can see an example of this below. More to come as I work towards building a set of processes for History students to begin archiving work in the Monroe Museum here in town. I’ve been playing recently with a great new piece of software called ReconstructMe which is free for now and Windows only. It uses the Xbox Kinect (an incredibly worthwhile investment for 3D scanning) to create 3D models. The greatest thing about this software is it stitches together scans in realtime so 360 degree scanning is easier than it has ever been before and the results are stunning. For this print I sat in a rolling chair with the Kinect mounted on a tripod faced at an angle and slowly turned 360 degrees to build it. I then used Tony Busers incredible video on cleaning up 3D scans to patch the holes, smooth out the rough areas, decrease the polygon count, and get a nice flat cut on the bottom to print on. This print is impressive! Not only is it the most realistic scan I’ve accomplished so far but it also made full use of the build platform for the Thingomatic making this thing about 4.5 inches wide and 3 inches tall. 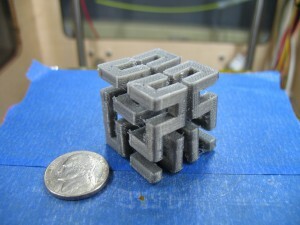 And we now have a Replicator on order that we should get before the Fall semester to print even larger objects! In many ways it feels like the advances being made in this field are so incredibly fast moving that it’s hard to keep up. The great thing is it feels closer to magic than reality, and how often do you get to say that about the work you do in higher education? As I started exploring what was possible in the Thingiverse I quickly saw a trend of people “upgrading” their 3D printers by building and printing items to get more use out of them. I’ve become addicted to printing these things because it’s just so cool to build parts on the device itself that will later make the device work even better. Here are a few of the upgrades I’ve printed so far. 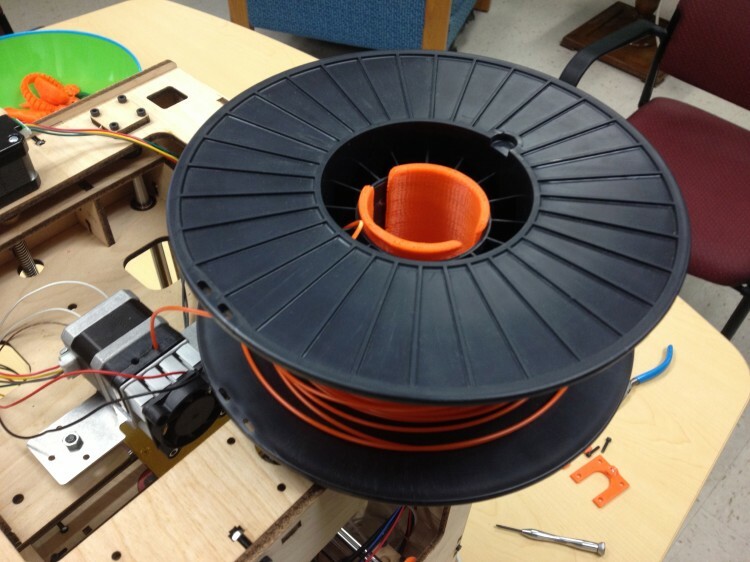 MakerBot Filament Spool Holder – This was one of the first upgrades I printed to provide a way to feed in the plastic without having to constantly monitor it and untangle. The plastic comes from the store on those black spools and they fit perfectly on this holder and rotate freely as the item prints. Motorola Droid Bot-Cam Holder – My previous phone was a Droid and I still had it in a drawer, so when I saw this holder I had to print it! Using a free app we can broadcast a live feed of what is printing on the Makerbot and view it on the web. 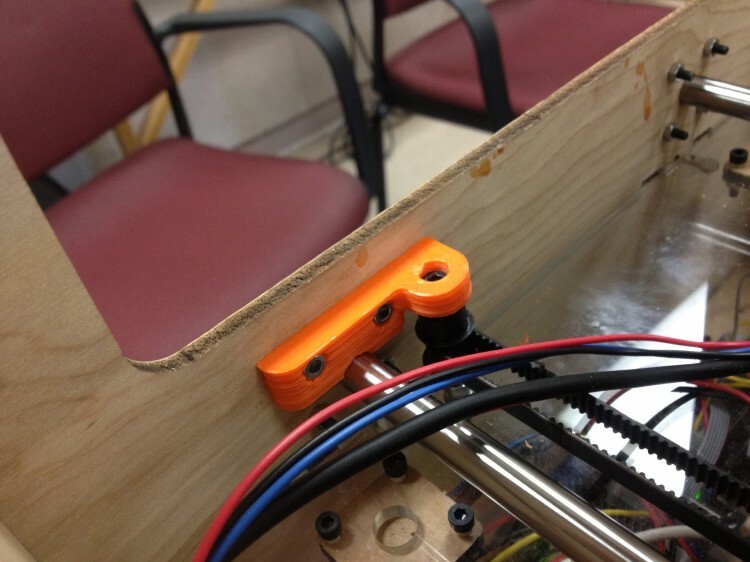 Y-axis Idler Support – This part holds the idler pulley firmly in place so that the belt doesn’t lose any tension. Tight belts make for cleaner prints. Universal X & Y Belt Tensioner – Normally when tightening belts on either the X or Y axis you have to loosen several screws and in some cases take out rods and remove parts. With these printed and installed I have a single bolt on the outside of face of the Makerbot for each axis that I can tighten or loosen. Again, by making sure the belts stay tight I can ensure the prints come out clean. Also on my list of things to print are these endcaps that you can use in place of the standard wooden ones to allow you to easily remove rods without fiddling with multiple screws. I’m having a lot of fun extending the MakerBot with the help of that same bot! That looks really cool but all the things I see just look like little plastic toys. 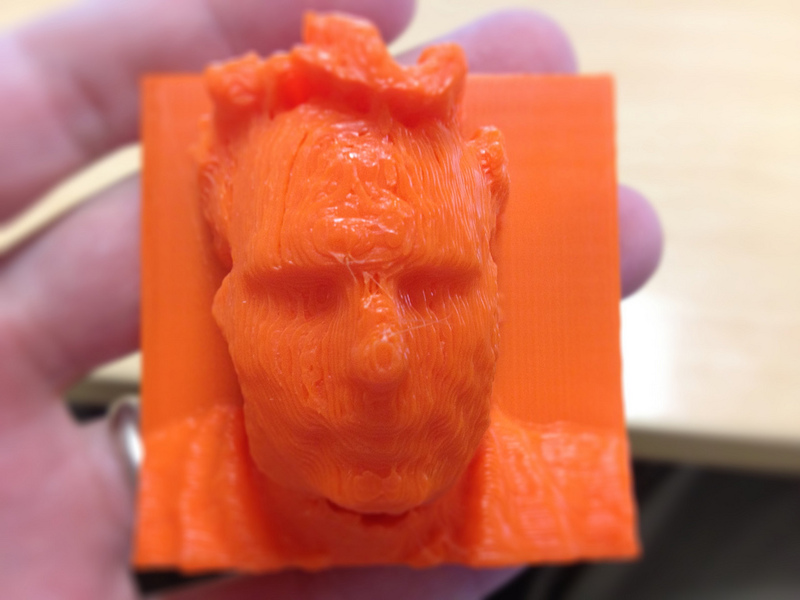 Is there really any educational value to be gained from a 3D printer? This question comes up quite a bit here at UMW and I think it’s a fair one to ask. After all, we’re an educational institution and the mission of the University isn’t to just buy things that are fun to play with (that’s a side benefit!). Given that George Meadows and I will be teaching a freshman seminar course in the fall integrating 3D printing technology it’s especially important for us to figure this out. There are many ways I could answer this question depending on my approach. We talk a lot about the rise of the “Maker Culture” and the power behind putting creation in the hands of students. I think that has real educational value. I also think there’s real value in experimentation and understanding that sometimes learning involves exploring without knowing where it will lead. Creativity and understanding happen at the very edges of our understanding and I’d rather being handing students a flashlight and asking them to go to those dark edges than handing them a pre-generated form filled solution to their own knowledge. But let’s look at this question at its very absolute basis: “What can I print that might have value in my classroom?” I think that obviously depends on what discipline you teach but I’m going to try to tackle a few of them here with some example objects that might help you visualize something in a real way for your students. That list is just a start based on what I’ve been looking at on Thingiverse. The field grows each day and with news that the Smithsonian is going to start digitizing 3D models of their work I expect in the next 2-4 years we’re going to see this niche technology explode. Have you come across any interesting models you could use in your classroom? One of the questions we get often from faculty and students is “How much does this all cost?”. Not only are they probably wondering about how much it costs to buy a device like this, but whether the software costs money, and more importantly how expensive is the raw material in relation to how much you can print. It’s always hard to answer that last one because the answer is really “it depends” but I was really happy to see the Makerbot Blog do a post on this recently. The device cost is straightforward: the new Makerbot Replicator is $1,749 completely assembled (an extra $250 if you want to do 2 color prints). At UMW we have a Thing-O-Matic which was Makerbot’s previous model and that was $1,250 as a DIY kit or $2,500 completely assembled. So the cost is dropping significantly. 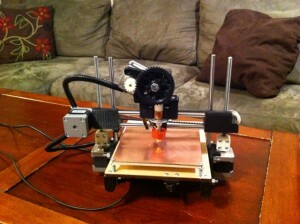 In fact there was a Kickstarter project for a 3D printer called the Printrbot that will be $499 completely assembled. 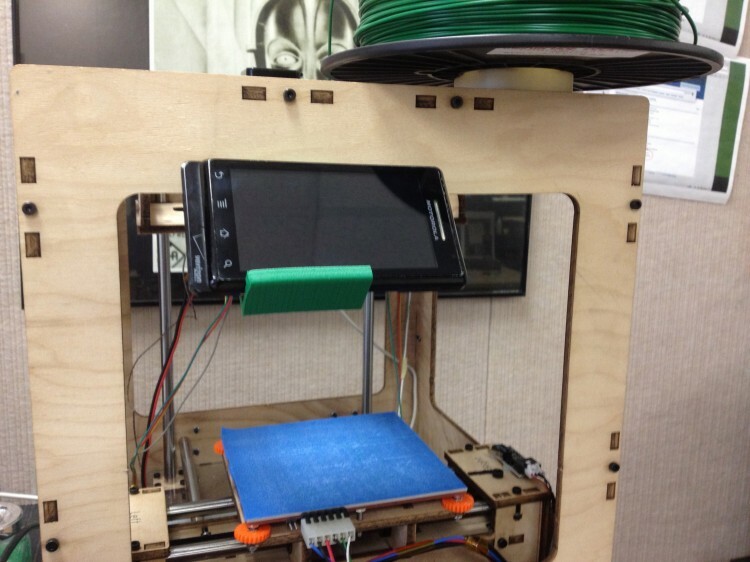 Your own 3D printer for the cost of an iPad! That’s one of the things I see as truly disruptive, where as the price of the device comes down it comes into more hands who tinker with it and find cool applications for the technology. 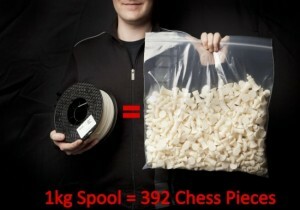 The spool of plastic sold in the Makerbot store is 1KG of plastic and costs between $40-$50 and as you can see that makes a lot of parts. One thing to keep in mind as well is that you can control the infill on an object. These prints we do are not 100% plastic. Often we can use just 20% infill and the device will be very strong. It prints a honeycomb pattern internally which saves on plastic and provides durability. You could also print a hollow object, although it would be a bit more difficult depending on the shape. It’s great to see 3D printing become affordable for the common consumer (and budget-wise university department) and I’m excited to see what develops as the cost continues to drop and the technology gets even better. A few weeks ago while researching options for creating 3-dimensional models from photographs, I came across a really amazing piece of software that is in beta right now (and free!) called 123D Catch. 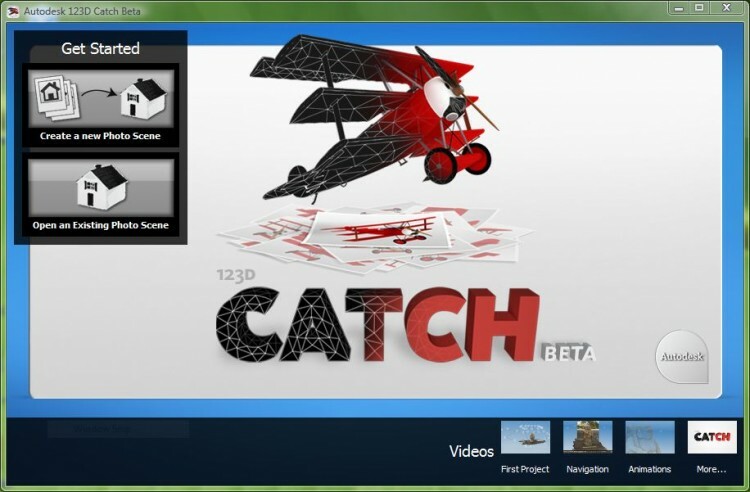 It’s from Autodesk who is well known for their CAD and 3D modeling software. Unfortunately it is only available for Windows right now, which is a real shame, but that wasn’t going to stop me from taking it for a test drive. The promise of the software is that you could take any old camera and take pictures of an object from all sides and send them to Autodesk’s servers and they would send you back a 3D model. Sounds like science fiction right? Let’s give it a shot and see if we can get something scanned in and printed out using it. 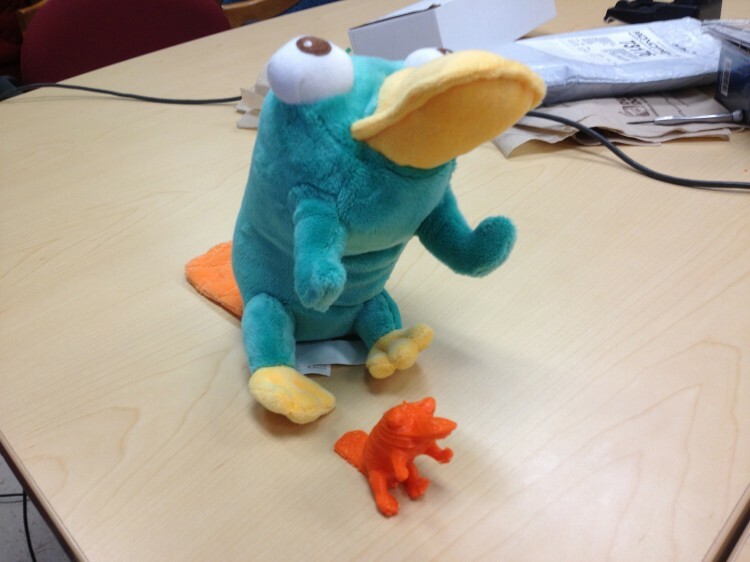 The first thing we need to do is grab photos of our subject, in this case it’s Perry the Platypus. I took roughly 40 shots just walking around the object and saved them all to a folder on the desktop. Then we open up the program and select the images. Once you’ve grabbed your images you can click the button to create a photo scene. I choose to have it email me when the process is complete because depending on the complexity of the model you could be waiting a few hours for the file to come back. All the processing happens on their servers (which is great because they probably have much more powerful machines doing the processing than this old Windows laptop I had lying around). Once I get the e-mail that it’s done I can download the file and open it up in 123D. The first thing I do after opening up the file is export it to an .obj file that I can use in a variety of programs to edit it. Here I have opened the .obj file in Meshmixer and I’ll use the lasso tool to discard the background objects and single in on just the model I want to eventually print. Ideally I’d also flatten the bottom but I’m still learning and haven’t found an easy way to do that yet, but this object is sitting on a table anyway so I’ll just print it on a raft to give it a solid base. This second screenshot is the final .stl file exported from Meshmixer and opened in Meshlab. 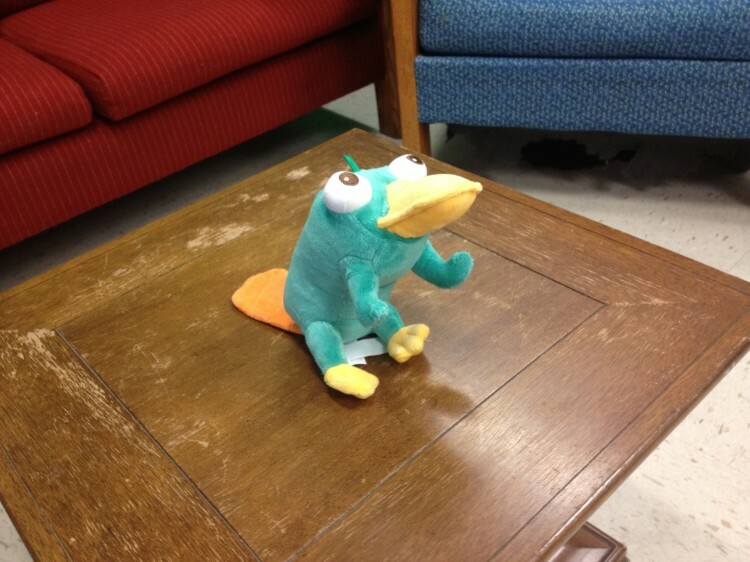 I’d say Perry is looking pretty good so far, let’s see if we can get him in plastic. Because of his arms extending out we need to print with support, which is as easy as selecting “Exterior Support” from the dropdown in the Print-o-matic settings when generating the gcode. 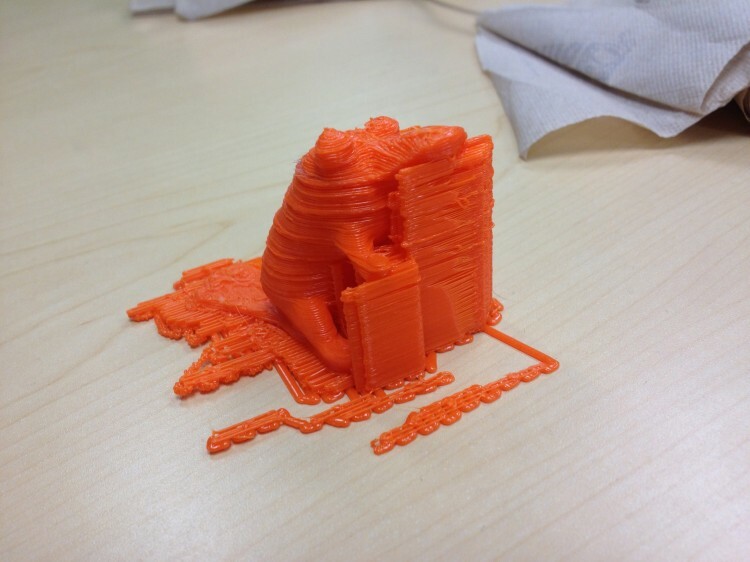 After an hour and a half of printing we get something that looks like this. This was actually my first time printing anything that needed support material and it worked pretty well. The support structure peels away fairly easily and after a few minutes of cutting and cleanup we’re left with a great little plastic model of our stuffed friend. I’ve included a photo below of the two of them hanging out together as well. I’d say for the first stab at scanning and printing this was a huge success. Clearly I could calibrate a bit more and learn how to clean up 3D models before printing them, but it’s amazing that this was accomplished with no expensive software or devices (the photos were all taken with my phone). We’re going to look into building a turntable with clean white background to automate the process of grabbing the still images. We’ve already seen a lot of interest from folks in the Historic Preservation as well as the Art Department here on campus for capturing real life objects as 3D models. I’m hopeful this will be a low-tech way of accomplishing this task and break new ground for using this device around campus. 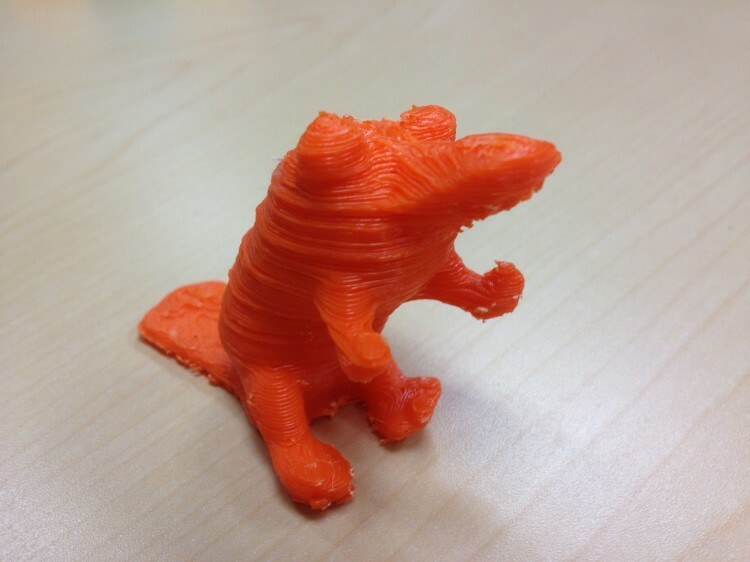 As if the very idea of printing 3-dimensional objects out of plastic isn’t crazy enough, there’s another aspect to it that never fails to blow minds when I talk about it to faculty, staff, and students at UMW. The Makerbot supports 3 different types of material with it’s hotend extruder nozzle, ABS, PLA, and Water Soluble PVA. ABS and PLA are just two types of plastic that have different melting points and get treated a bit differently (we have up until now printed solely with ABS as it is the most popular and reliable plastic). But what is water soluble PVA? This newer material gets interesting mostly when talking about the recently released Replicator which has 2 nozzles for extrusion. The reason being that water soluble PVA, much as the name implies, dissolves in water. this means you can use it to print support material alongside your regular print that will later dissolve away in water leaving a solid structure. The possibilities this affords are great for things like visualizing mathematical functions which can take ornate and complex shapes that can be practically impossible to print without a support structure in place. 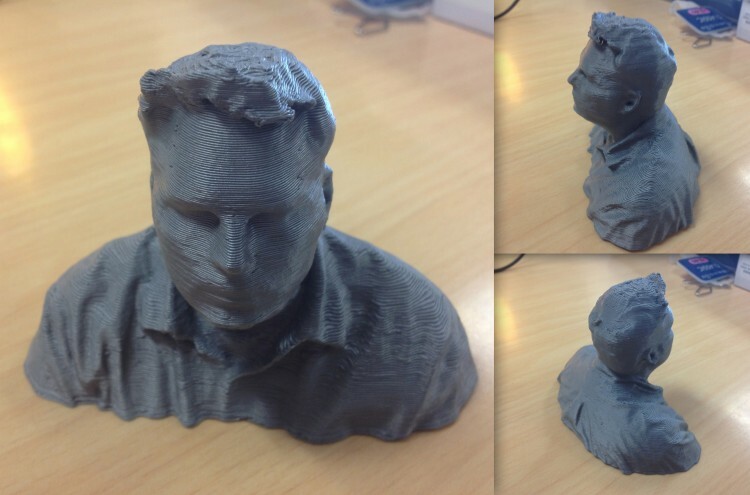 Using PVA we can have limitless overhangs on prints, build in clean rafts for prints without worrying about how to detach them later, and begin to tackle the more complex prints that our students might begin to create in Blender or Google Sketchup. Because it’s not practical to switch materials mid-print, the Replicator (or modifying a Thing-O-Matic with a second extruder head) is really a necessity to taking advantage of this technology. I have high hopes that we’ll see this at UMW in the coming months as we continue to experiment in this new space and see what’s possible. 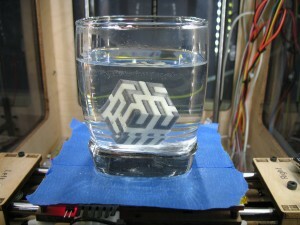 What ideas could you come up with using a dissolvable support structure like PVA? One aspect of 3D printing that is still racking my mind is what it means for intellectual property and copyright law. Copyright doesn’t even feel like the right term when talking about physical objects, perhaps IP is better. Of course we already have patent law and the many problems that have come with it right now. But we’re entering a world where people are going to be able to distribute a digital file across the web and the end user will be able to print that physical object in real life. Don’t believe me? 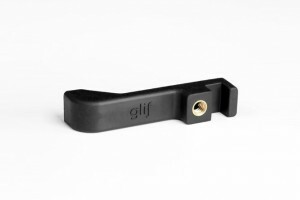 This is the Glif, a tripod mount built for the iPhone. It was originally conceived as a Kickstarter project that received funding above and beyond what the makers ever could have imagined. It is now sold commercially through their website alongside their other creations for $20. Yet, a quick search on the Thingiverse leads me to this “Tripod Mount” that has been “inspired by the Glif”. Has a law been broken here by the person who created this model? Clearly he didn’t use source files and built his own version of it, yet the design is unmistakably the same. If I download and print this item am I breaking any laws? The license applied to the model is CC-BY-NC which says I’m allowed to use it and remix it as long as I don’t sell it. But is such a license even valid when the design of the object is clearly a derivative (practically a copy) of an original item? At the moment their are only a handful of objects on that site and nothing entirely controversial. But I’ll be interested to see if we’re saying the same thing in 5 years. The Thingiverse has already grown so big and there’s a ton of creativity pouring out of that site. My hope is that we can continue to foster creativity and innovation in this space without getting caught up in so much legalese that we stifle the very spirit of maker culture that has fostered this community. Say hello to the Printrbot, a small portable 3D printer that can be assembled in an hour and costs just $499. I’ve mentioned before how cost plays a huge role in disruptive technologies like 3D printing. This technology is not extremely new but companies like Makerbot have brought it mainstream by making consumer-grade devices at an acceptable price point. Printrbot is changing the game by removing both the cost barrier and the large undertaking of assembly. Imagine getting a grant to buy a few of these and having your students spend an hour assembling them in groups. Putting together a 3D printer would normally be a semester-long project. Now it can take just one period and you can spend the rest of the time exploring ways of utilizing the technology. The inventor, Brook Drumm, released his concept as a Kickstarter project to huge success and not only funded the project but exceeded funding by over $800,000! What’s even cooler is that just today he has released all of the source files for the design of the project on Thingiverse for anyone to print and build their own. 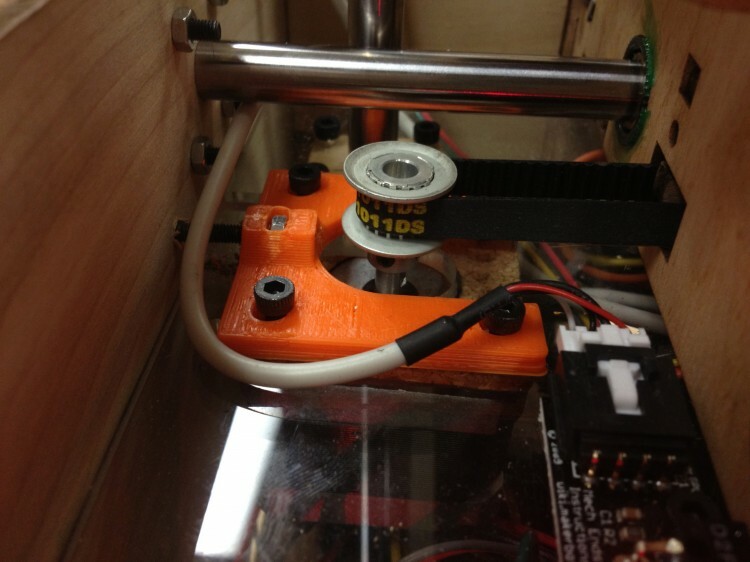 With the purchase of a few motors, rods, and circuitry and printing the rest of the parts on an existing printer, you can build your own Printrbot. It’s an exciting project and I hope to see him open up sales on his website for the public sometime soon so those who didn’t get in on the Kickstarter campaign can buy their own. The Xbox Kinect is a popular accessory to the Xbox 360 gaming console, but it’s also been hacked away at by a community of people doing interesting things with the device. You see, the Kinect has 2 cameras that can read depth information, which makes the device much more interesting than a simple webcam. In a way it makes the perfect device to scan in imagery of a physical object for scanning, and that’s exactly what I wanted to try. I’m no hacker, just someone who likes to fool around with these things, so I was lucky to find a program called KinectToSTL which was built specifically for grabbing files that could be printed on a Makerbot. You can grab the OS X app here and if you have a Kinect make sure it’s plugged in via USB to your computer before opening it up. The interface is very basic with some controls for deciding how deep, tall, and wide the shot should be. You can also adjust lighting but thats more to help you see details on screen. When you’re ready to grab your shot just click the “exportSTL” button and it will throw a file in the data folder. You can open that STL file in ReplicatorG and it should be ready to print. 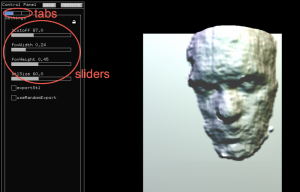 It’s a really cool way of easily scanning in objects, particularly faces, and getting a 3d model without much cleanup at all. One thing I want to work on is how to get a full 360 degree image of an object. Right now using a single Kinect limits you to only what the camera can see. Either by combining multiple STL files with joining or using a different method all together I think you could get a full model, but I have yet to get that working. I’ve got a few ideas though and will be sure to blog them once I have it figured out.